While on a flight from Denver to Portland, the aircraft ran out of fuel while the crew was distracted with a landing gear problem. Failure of the captain to monitor properly the aircraft's fuel state and to properly respond to the low fuel state as indicated by other crew members. Contributing to the accident was the failure of the other two flight crew members either to fully comprehend the criticality of the fuel state or to successfully communicate their concern to the captain. The aircraft crashed into ocean during a landing approach. Poor monitoring of altitudes and too early a transition from ILS to visual flight procedures. Pilot flew into white out conditions and suffered spatial disorientation. Continued VFR flight into adverse weather conditions. Collided with wires in fog and low ceiling. Continued VFR flight into adverse weather conditions. Couldn't climb on takeoff due to non-availability of leading edge slats, overran the runway and killed one passenger and 3 maintenance workers on the ground cutting grass. Nonavailability of leading edge devices immediately after rotation during take off. Forced to return to Steamboat Springs due to severe icing, the plane crashed into a 10,530 ft. mountain. Severe icing and strong downdraughts associated with a mountain wave which combined to exceed the aircraft's capability to maintain flight. Contributing to the accident was the Captain's decision to fly into probable icing conditions that exceeded the conditions authorized by company directives. Partial No.1 engine failure during takeoff. Crashed. Crashed in rain, fog and low ceiling. Continued VFR flight into deteriorating weather conditions. Crashed in the Rubio mountains. Crashed into a mountain and burned short of the runway after experiencing engine failure. The aircraft sank in the sea after the left wing tip struck the water in heavy rain and wind. Crashed on final approach in sleet, freezing rain and low ceiling. Pilot failed to maintain flying speed and stalled aircraft. Crashed while on an ILS approach in fog and low visibility. Improper IFR operation. Tower advised pilot was 1/2 mile off course. The pilot flew into a mountain pass became suffered spatial disorientation and crashed. Continued VFR flight into adverse weather conditions. Not instrument rated. Crashed following engine flame out in icing conditions. The tail rotor pitch control system failed shortly after taking off. The helicopter tried to return and crashed. Crashed after the left engine flamed out on takeoff. The military transport crashed into a fog-shrouded hill, 20 miles south of the city. Lost both engines on climbout and made an emergency landing on a sandbank of the Irrawaddy River. After taking off, one of engines stalled due to a damaged #5 cylinder exhaust. The pilot attempted to return to to Kuopio. He turned but the plane lost control and crashed into Lake Juurusvesi. Flew into vortex turbulence and crashed while attempting to land. Unable to communicate on terminal radar service frequency. Crashed in fog and low ceiling. Continued VFR flight into adverse weather conditions. Improper emergency procedures. Landing gear would not retract. Midair collision. The PSA was descending and about to land at Lindbergh Field. The Cessna was climbing while engaged in practice approaches. The 727 overtook and struck the Cessna from the rear. The primary cause was the PSA crew lost sight of the Cessna and did not make that fact known to the ATC. The ATC failed to realize from the PSA transmissions that they lost sight of the Cessna. One hundred thirty-five killed on the PSA, two on the Cessna and seven on the ground. Crew fatigue may have played a part in the accident as there are unofficial reports that the crew attended an all night party and had only 2 hours sleep from the night before. Disappeared en route. Aircraft or those aboard never found. The domestic flight crashed while attempting to land at Paranaque in thunderstorms with heavy rain and wind gusts. Possible lightning strike. The float plane flew into a blind canyon and crashed into water. Continued VFR flight into adverse weather conditions. The helicopter experienced rotor failure. Undersized threads on anti-node bar. The plane crashed while taking off after engine failure. Connecting rod bolt or nut failure for reasons unknown. The aircraft took off from from Kariba Airport at 17.10. Shortly after departing Kariba, the starboard wing was hit by a SAM-7 missile. The crew tried to make an emergency landing in a large clearing in the bush. The aircraft crash landed, striking an irrigation ditch, cart-wheeled, broke up and caught fire. Soldiers from the Joshua Nkomo's Zimbabwe Peoples Revolution Army, who were responsible for shooting down the airliner, later killed 10 of the 18 survivors. The remaining survivors were rescued the next day. While on approach, the aircraft yawed to the left and plunged into the ocean in a left-wing and nose-down attitude and sank. In-flight failure of the left-hand inboard flap control rod that led to a sudden retraction of the complete left-hand flap system and sudden loss of control. The aircraft made a force landing in the water while en route. Overloaded. Allowed to take off with too much weight. Improper emergency procedures. Crashed on takeoff. Down elevator control stop backed out, limiting down elevator travel to 1 1/2 degrees of normal 20 degrees. Pilot misjudged altitude and clearance and crashed while descending to land. Alcoholic impairment of pilot. Crashed en route. All twelve bodies recovered. The aircraft, flying VFR, collided with a mountain in deteriorating weather condtions after being blown off course which went unnoticed because of lacking navigational equipment. While en route the pilot decided to fly at a lower altitiude to avoid weather but crashed into a hill. Flying VFR in IFR conditions. The helicopter crashed 87 miles northwest of Bergen on a ferry run to an oil drillilng platform. The aircraft overran the runway and crashed into a revine after an aborted takeoff due to a blown tire. The No. 3 tire failed on takeoff and debris damaged the right gear 'down and locked' switch, causing a gear unsafe indication in the cockpit. Debris was also ingested by the No. 2 engine causing a loss of reverse thrust during the rejected takeoff. Crashed in heavy fog while attempting to take off. The flight engineer accidentally shut off the automatic transferring of fuel from the sump tank. Eventually all three engines stopped and the plane crashed. Fuel starvation. The aircraft crashed while attempting a non-precision instrument approach to Pensacola and landed in 12 feet of water, 3 nm short of the runway. Failure of the crew to monitor altitude and descent rate and the failure of the 1st officer to provide the captain with the required altitude and approach performance call-outs. Also the flight engineer disabled the GPWS alarm so the crew could hear one another better. In addition, the night flight had been diverted from its primary airport due to poor weather and was required to execute a compressed approach (descending and approaching more quickly and steeply than normal), and the crucial altimeter readout was an old drum-roll-counter type (due to be replaced), which could easily be misread, especially in heavy workload situations. Three fatalities occurred when the frightened passengers grabbed their seat cushions and exited the plane from the rear. They drowned in part because their seat cushions were not flotation cushions. The airplane was not required to have floatation cushions because it was not flying over water. Crashed on farmland six miles outside of Bogota shortly after taking off. The pilot took a shortcut over the mountainous center of Upolu instead of flying along the coast as per company procedure. Lost control and crashed after the pilot entered a known area of severe turbulence and thunderstorms. The aircraft, which deviated off course, suffered rapid decompression after being fired upon by a Russian fighter. The aircraft made an emergency landing on a frozen lake. Made a forced landing in water. Fuel starvation. Inattentiveness to fuel supply. Fuel selector positioned between tanks. The helicopter was attempting to land on an oil drilling platform. The co-pilot suffered spatial disorientation and stalled helicopter and crashed. The plane lost engine rotation after takeoff and the pilot attempted to return to the airport for an emergency landing. Due to the low altitude, the plane stalled and crashed in Paraiba River, one-half mile from the runway. Mechanical failure. After an explosion, the aircraft went spinning into the ground and crashed into a field. Crashed into a mountain in fog. Continued VFR flight into adverse weather conditions. Crashed shortly after takeoff. An undetermined emergency of some kind occurred during the climb after takeoff resulting in loss of control of the aircraft. Crashed on final approach after flying through areas of turbulence and thunderstorms. Crashed on final approach in rain and low ceiling. Improper IFR operation. Pilot attempted operation beyond experience and ability level. Pilot failed instrument check 4 days before accident. The aircraft crashed into the ocean shortly after takeoff due to problems with the artificial horizon. The pilot radioed he was having an instrument failure. The plane the banked to the left and crashed into the sea. Midair collision. The Fokker collided with the MiG which was performing touch-and-go landings. Error by the MiG pilot. Sixteen killed on the Fokker and two on the MiG. Crashed after experiencing engine failure on takeoff climbout. While approaching V1 speed on takeoff, a loud bang was heard followed by shaking of the aircraft. The crew decided to abort the takeoff. With the end of the runway approaching, the captain steered the aircraft off the runway to the right. The landing gear failed and resulted in a fire. The plane slid for approximately 650 feet and came to rest 40 feet right of the runway centerline. Several passengers not heeding the warnings of the stewardess exited onto the wing and fell into the fire. Failure of two tires on the left main landing gear resulting in failure of a third tire during a critical point in the takeoff. This was to be pilot Gene Hershe's last flight before retiring. Continued VFR flight into adverse weather conditions. The pilot suffered spatial disorientation and crashed in rain and low ceiling while en route. Continued VFR flight into adverse weather conditions. Crashed into obscured mountain while en route. Continued VFR flight into adverse weather conditions. Radar showed aircraft circling over mountain tops for over 12 minutes. The aircraft touched down just as the crew noticed a snow plow on the runway. A go-around was initiated but the thrust reverses did not stow away properly because hydraulic power was automatically cut off at lift-off. The aircraft missed the plow, overran the runway, crashed and burned. Estimated time of arrival given by Calgary ATC in error. Crew did not report over its final approach beacon. The aircraft crashed shortly after taking off from Richland after climbing to 400 feet and stalling. Crew error. The failure and inability of the flightcrew to prevent rapid pitchup and stall by exerting sufficient push force on the control wheel. The pitchup was caused by the combination of a mistrimmed horizontal stabilizer and a center of gravity near the aircraft's aft limit. The mistrimmed condition resulted from discrepancies in the aircraft's trim system and the flightcrew's preoccupation with making a timely departure. The out-of-trim warning system was inoperative. The passenger flight attempted to make an emergency landing at Artigas Airport when it had taken off from. 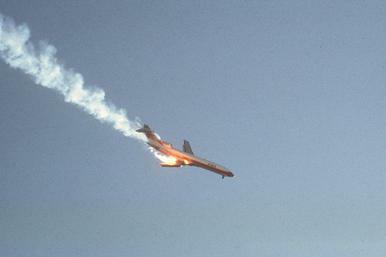 An engine failure was followed by a wide banking turn and crash to the ground bursting into flames. Struck a 7,000 ft. mountain in fog. Crashed after engine failure on climb to cruise. Fuel starvation. Ice in fuel. Improper emergency procedures. Crashed into electrical tower while in landing approach, 1 mile short of the runway. Previous damage caused the aileron surface attachments to separate in flight. Following a right turn, after taking off, the plane rolled to the left beyond 90 degrees, went into a steep dive, crashed and exploded in shallow water. Irrational control wheel inputs on the part of the captain after his attitude director indicator malfunctioned leading to complete loss of situational awareness.